Melaleuca steedmanii is a native of Western Australia and is one of a large number of colourful species from the west. Most are virtually unknown in cultivation but have great horticultural potential. 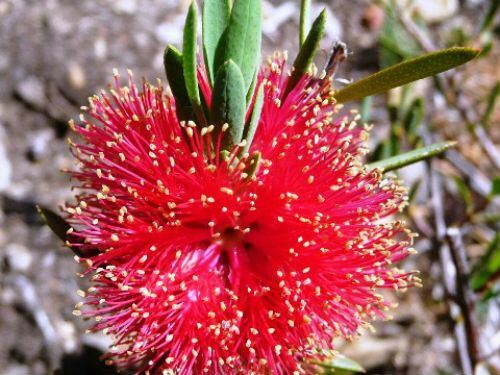 Melaleuca steedmanii is a medium to tall shrub that may reach a height of three metres. Plants this tall often become straggly. Judicious pruning will remedy this problem and keep plants bushy and blooming bounteously. Leaves are blue-green, narrowly elliptical or oblong, crowned with a sharp point. Flowers are carried in lateral spikes four to six centimetres long by three to four centimetres wide. They are an eye-catching scarlet and attract honeyeaters. Blooms appear in September and October. A Melaleuca steedmanii, in full flower, is a memorable sight. When the flowers fade cut off each stem behind the spent blooms. This will trigger new shoots and in the following spring each new shoot will carry a flower spike. Propagate from seed or cuttings. We prefer to propagate from cuttings. They strike readily and will flower sooner than seed grown plants. The species is named after H. Steedman who first collected the plant in 1926. Some botanists consider Melaleuca steedmanii to be a subspecies of Melaleuca fulgens.